The weather today didn’t quite work out the way the forecast had suggested it would. It would be dry and cold since the air flow is coming straight down to us from the Arctic, and the overnight cloud would have gone by mid morning leaving us with bright sunshine and clear blue skies until about three o’clock. Well, they got the dry and cold part spot on, but the cloud persisted all day which just goes to show that the Lake District weather does its own thing despite all the the Met. Office’s best efforts. It didn’t spoil our day but it did mean that the light was poor and some of the photos suffered as a result. 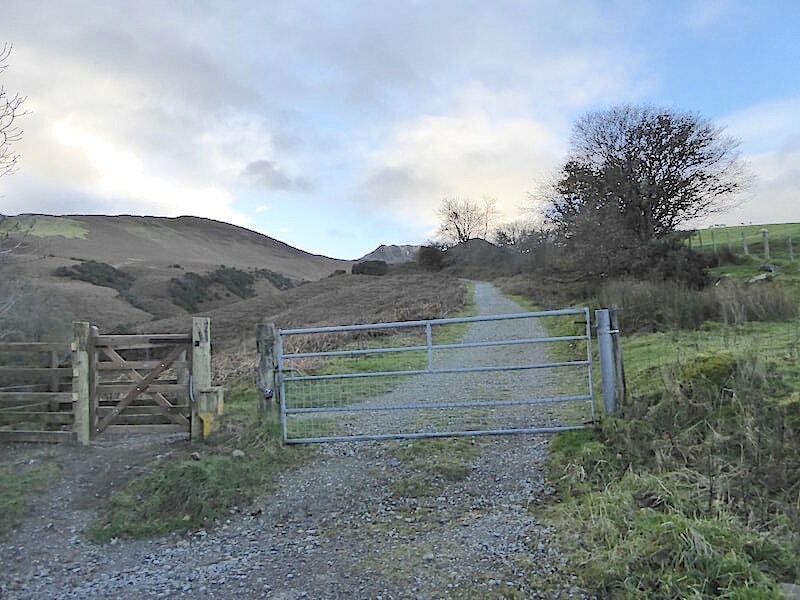 We parked up on one of the lanes in Braithwaite, just outside Keswick, and here we are just about to go through the gate and start making our way over to the open fellside. 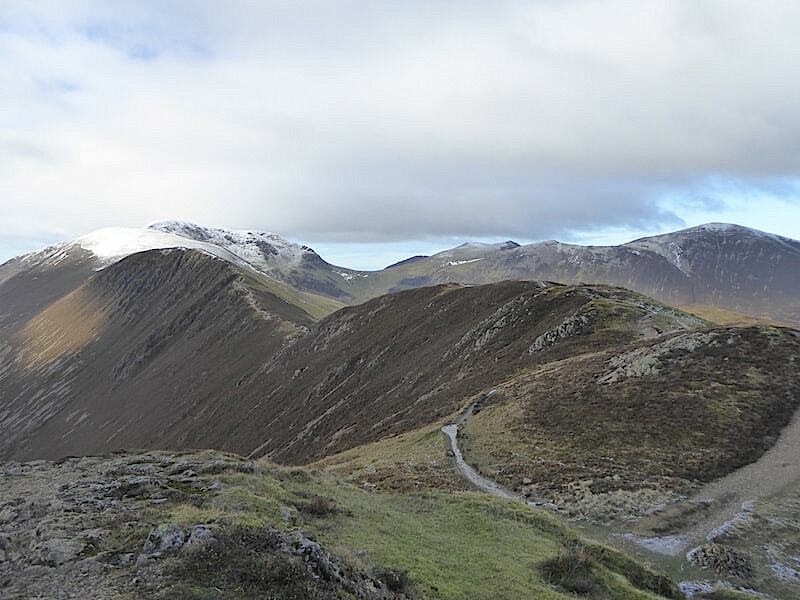 On the skyline in the centre are the knobbly knuckles of Causey Pike, the first fell we will walk up today. 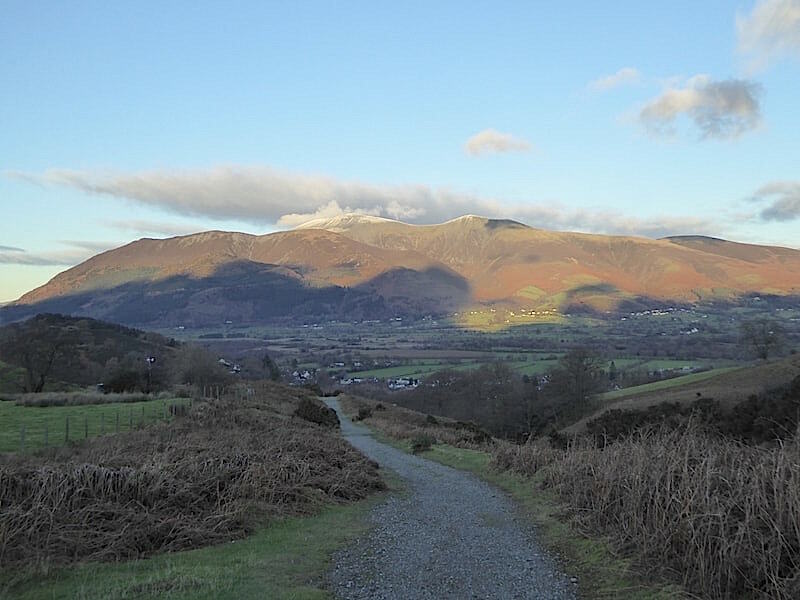 The light is low since the sun is in hiding, not only behind Causey Pike but also the cloud which is hanging over it. There’s a good laid path from the gate, which is concrete in places, as far as the group of trees on the right where it comes to an end. 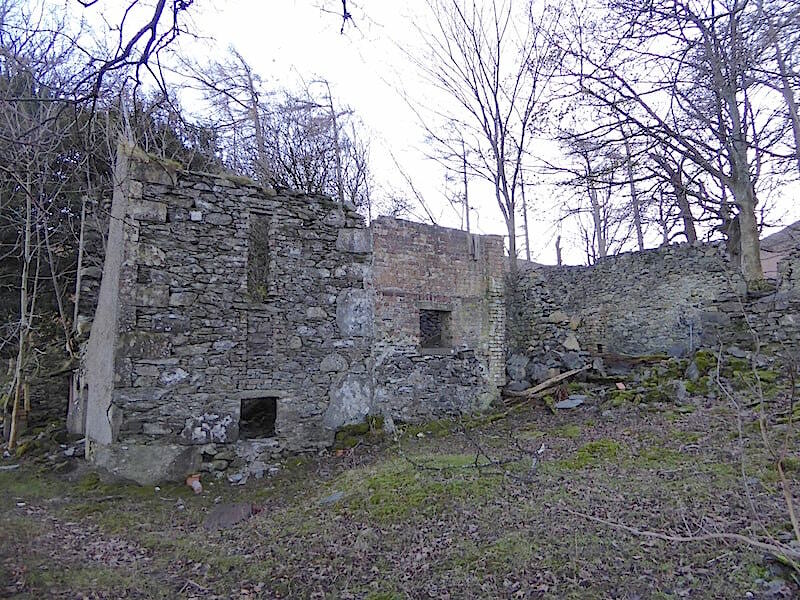 There’s a derelict building in the trees so we decided we’d have a look round it on the return leg. 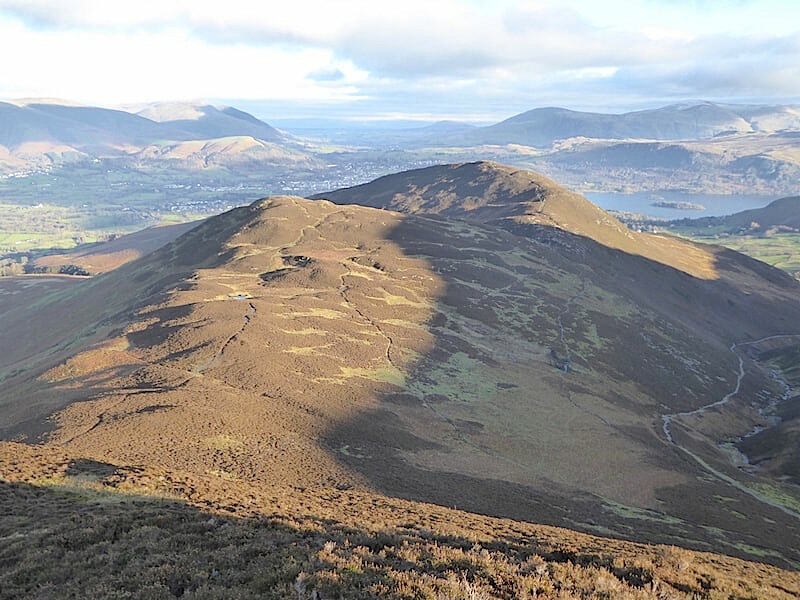 The knuckles of Causey Pike are standing out a little more clearly now, and to its left and right respectively are Barrow and Stile End. Stile End ahead with the top of Outerside just in shot over to the right. The path looks deceptively flat but right from the start its a long steady climb up to Barrow Door, which is the flatter area between it and Barrow on the left. If we were feeling the cold as we set off we certainly weren’t by the time we got to Barrow Door, hats and gloves were off and jackets and fleeces were unzipped, anything to let out the heat from the sauna like conditions created by full winter clothing and a long walk uphill. 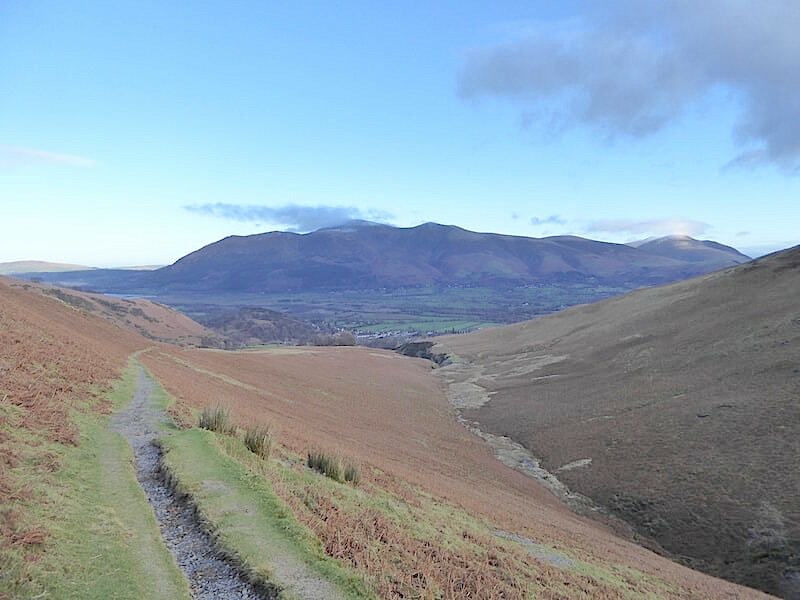 The gradient eases as we traverse the lower slopes of Stile End above Barrow Gill and I took a look back at Skiddaw and the northern fells around it. No sunlight on them just yet so they look as though they are still quietly slumbering. We reach Barrow Door and continue on around the base of Stile End. 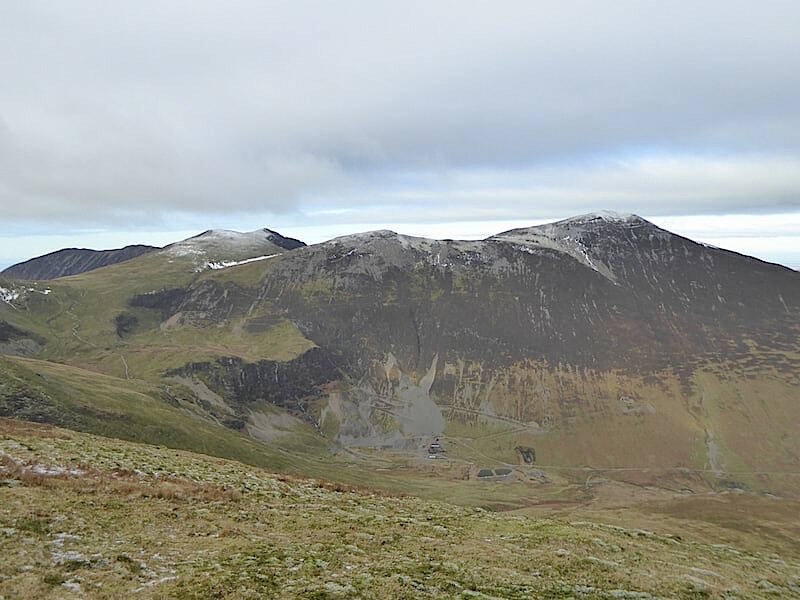 The snow has melted on Causey Pike but it looks as though Sail and Crag Hill beyond it still have a good enough covering. There hasn’t been an overnight frost but the ground was firm and all the small puddles along the path were iced over. 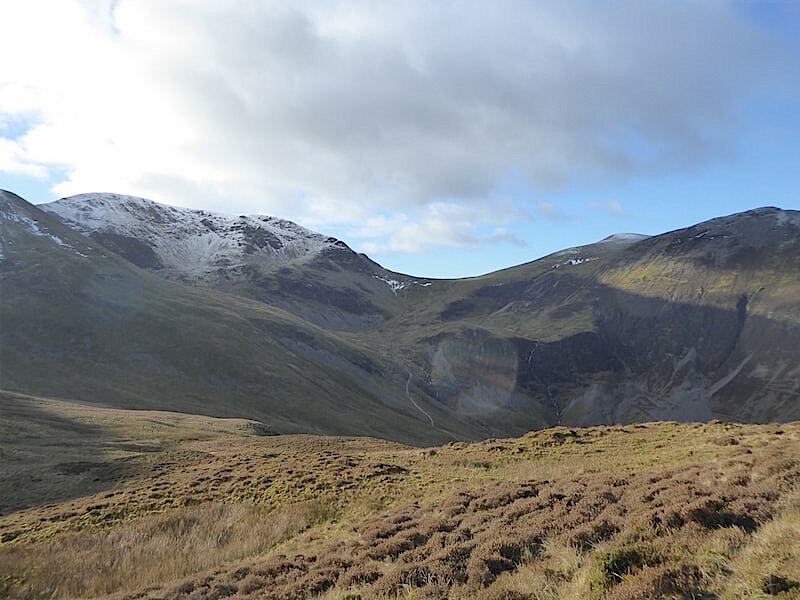 A look back at the heather covered Barrow, which will be the last summit of our walk. The gap between it and us is Barrow Door. A look down into Stoneycroft Gill as we walk along the higher path on the slopes of Outerside. A little further along and our path and the one running alongside the gill will meet and continue on above and alongside the gill. Ahead of us is Outerside with the Stoneycroft Gill path curving up below it. The path we’re on at the moment curves over to the right and then swings back left to eventually join it. 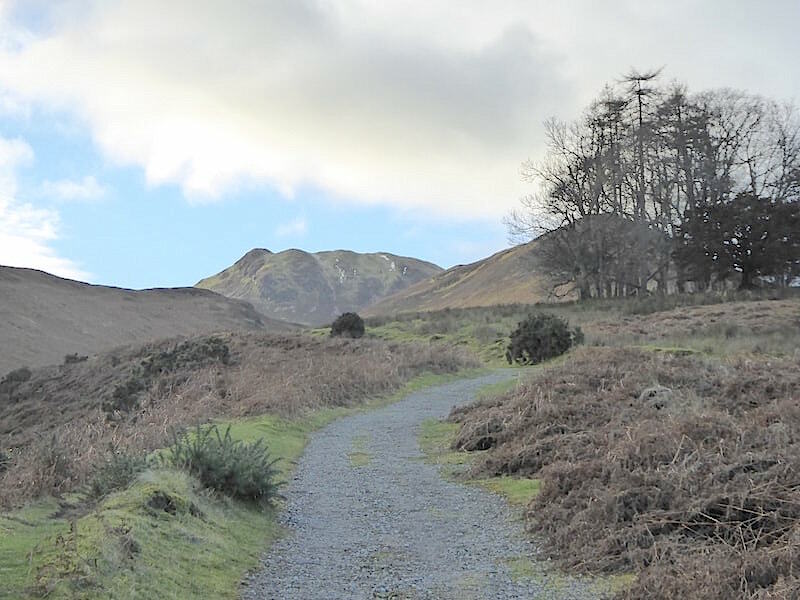 At the moment there is absolutely no-one on any of the paths around here, and the only sound is the two of us crunching along the path and the occasional raven calling out. 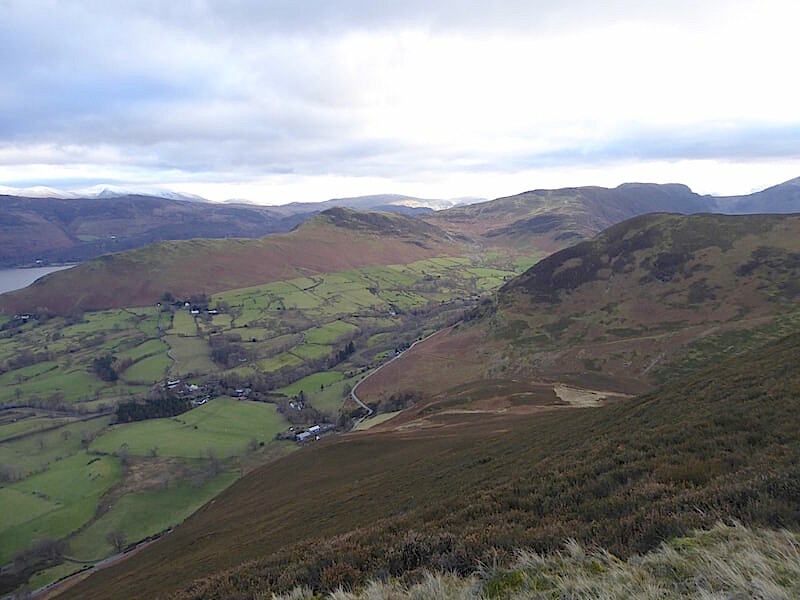 We had a short coffee break in the sheepfold and watched as a walker, who we had noticed coming up behind us on the Stoneycroft path, veered off the path, crossed the gill and proceeded to make his way straight up Causey Pike’s steep grassy slopes over to the right. He had a brief stop about half way up and then went on his way again. 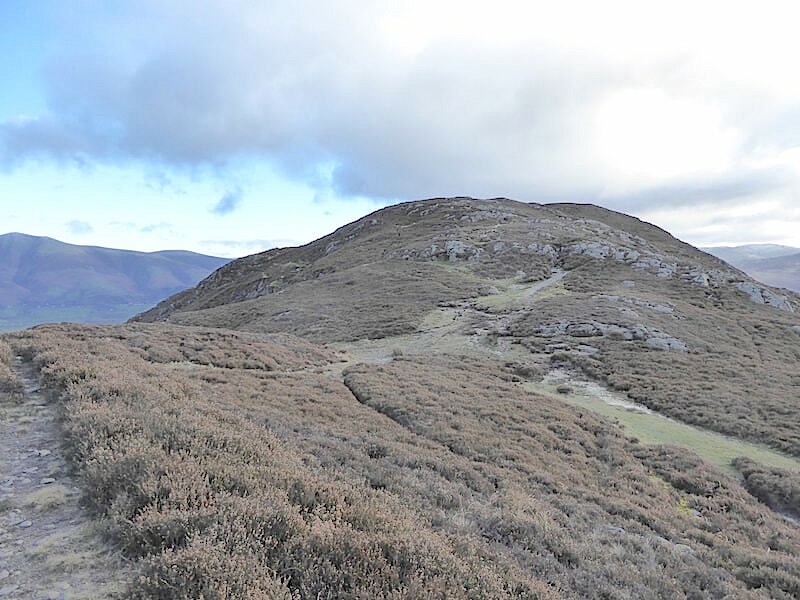 We lost sight of him as he reached the heather but noticed him on the summit as we were making our way up the traverse path, which starts just a short distance away on this side of the sheepfold. The second person we have seen so far was the mountain biker who was labouring his way over the rough track towards us. 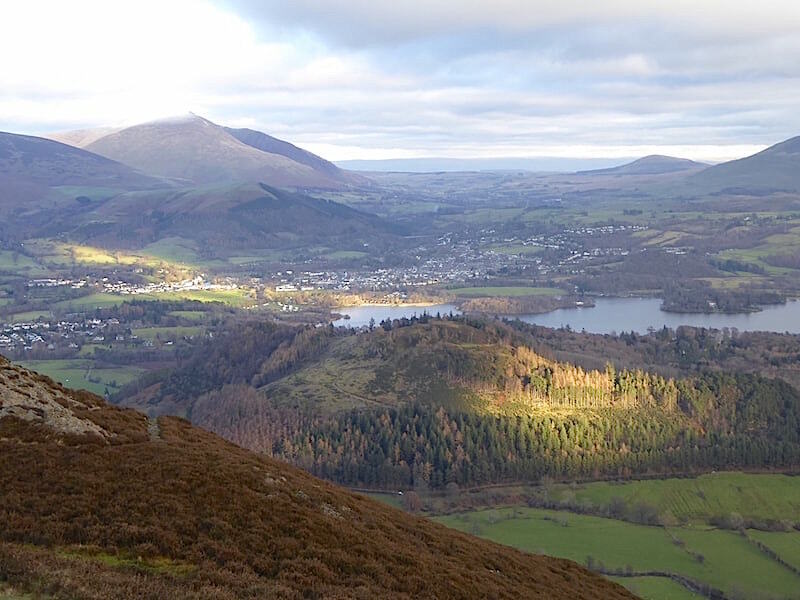 The sun is still noticeable by its absence …..
….. although it has managed to land on Skiddaw and wake it from its slumber. 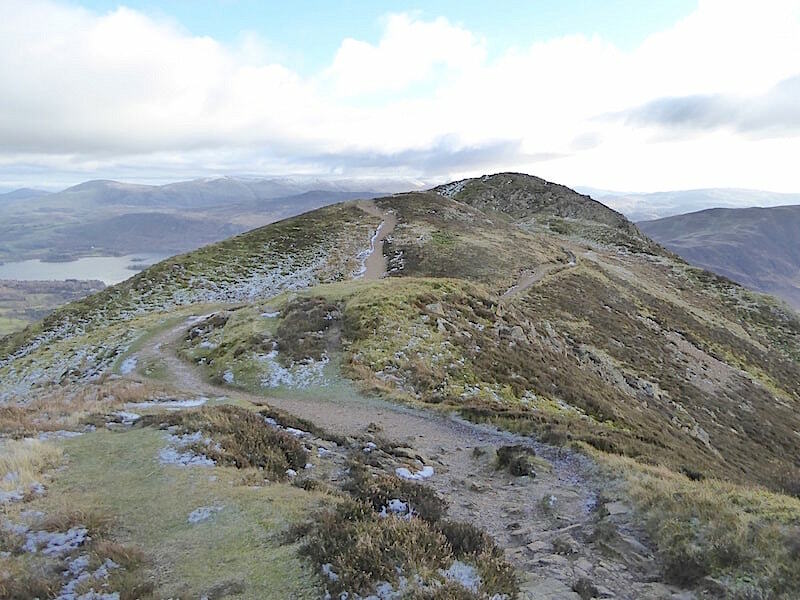 We are now climbing up to Causey Pike summit using the traverse path which is rather less steep than the route chosen by the walker whom we had watched from the sheepfold. 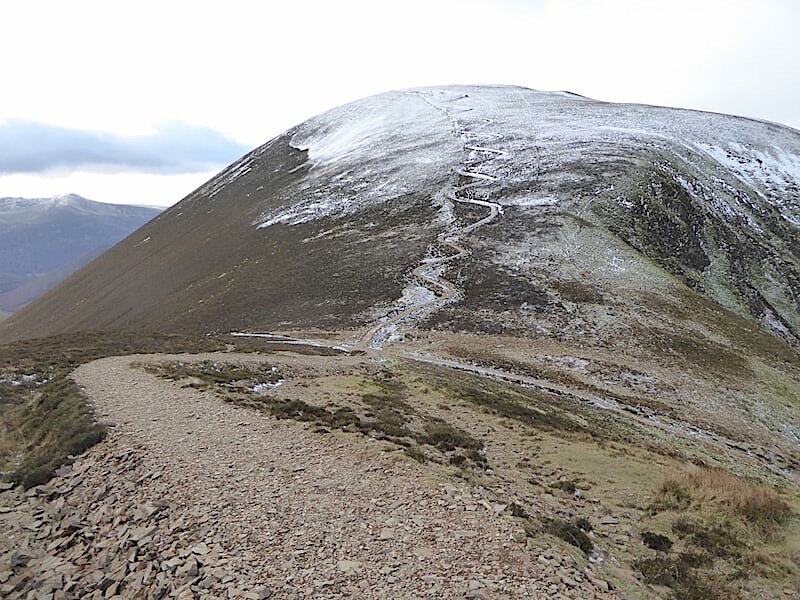 We can now see him on the summit, plus another solo walker who had reached the summit before him, probably from Rowling End, and who was now descending back down to the little col before continuing on to Scar Crags. A look back from the very icy traverse path, had we not had the grassy patches to step on we would have put the spikes on. In the middle foreground the Stoneycroft path continues on up to Sail, or you can veer off to the right, across the brown and soggy area of High Moss, and carry on up Outerside. That’s what we’ll be doing on our return leg. 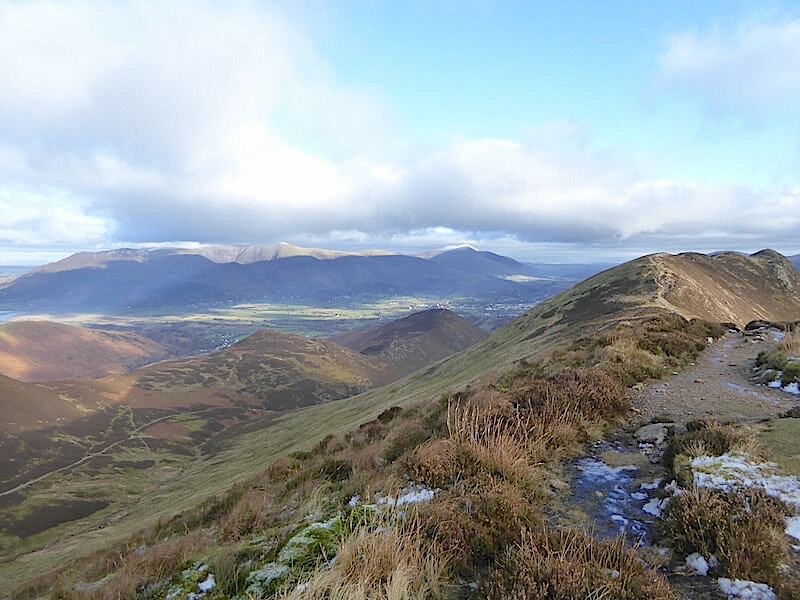 Beyond Outerside is shapely Grisedale Pike which also is largely snow free now. 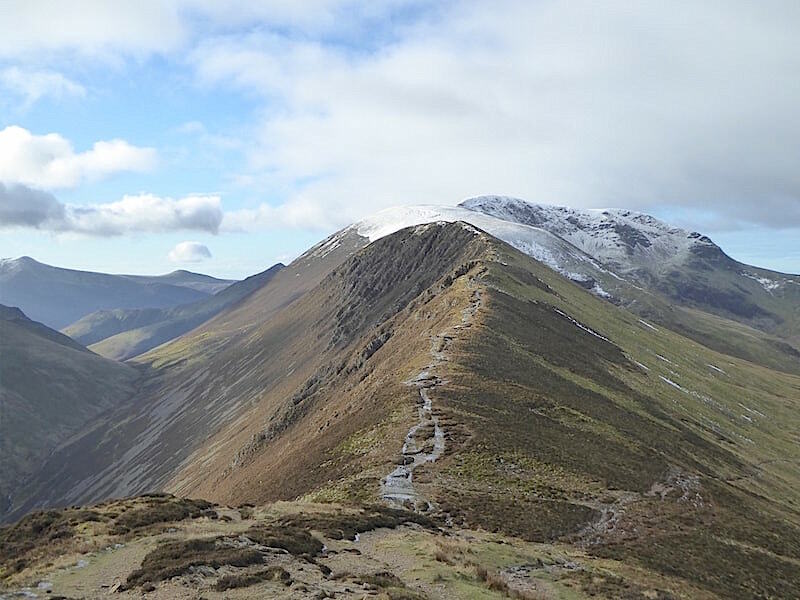 We reach the col and with my back to Causey Pike I took a look at the icy route over to Scar Crags. A pair of walkers were just below the col over on the left, one rummaging in his pack and pulling out another layer of clothing which he proceeded to put on, the other one sitting down and having a bite to eat I think. 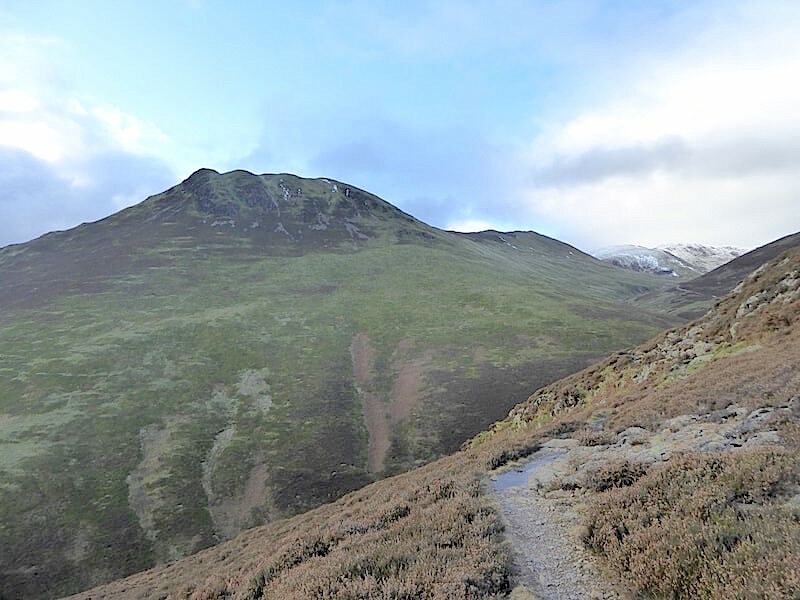 We had seen these two coming down off Causey Pike too as we made our way up here, so we’ve seen only five people so far. 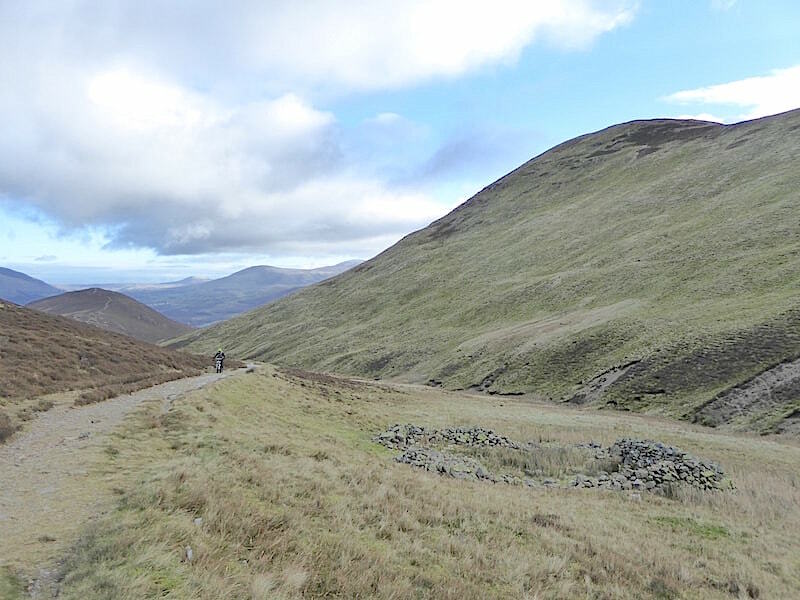 A look back as we turn left at the col and continue on …..
….. up and over the various humps and bumps towards the summit. 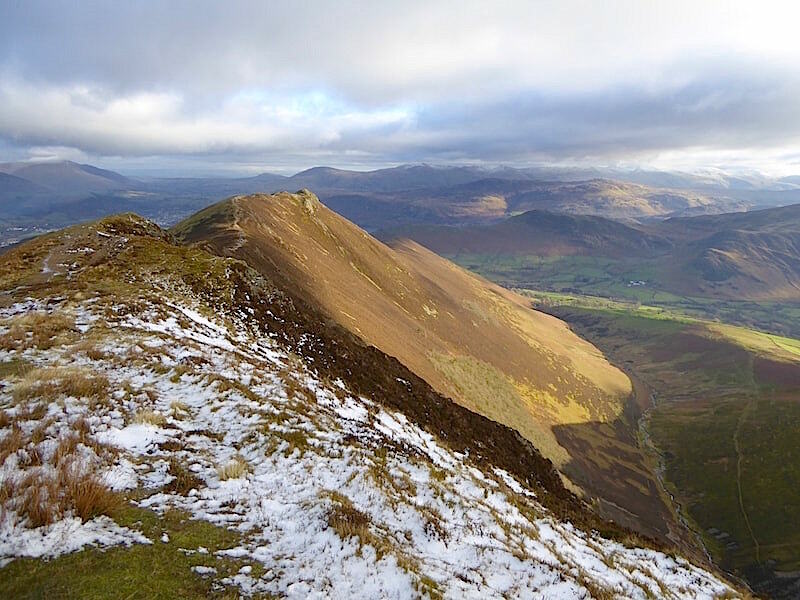 It looks a bit bleak on Causey Pike and it was, so hats, hoods and gloves are back on and all the zips are fully fastened. Its now a matter of keeping the heat in rather than letting it out, especially as the keen wind is sneaking its way into every little gap it can find. 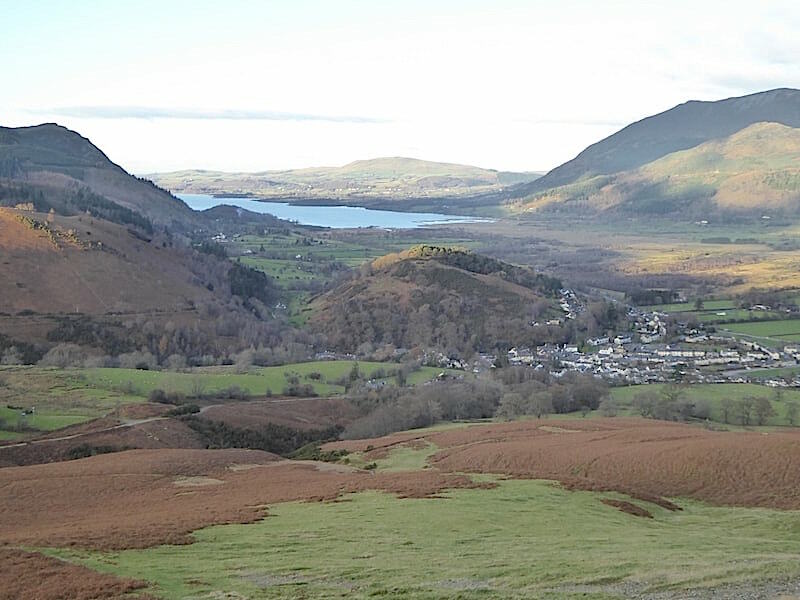 I have a little wander around the top and take a few shots of the various views …..
….. looking eastwards across Rowling End towards Derwentwater and the fells beyond. 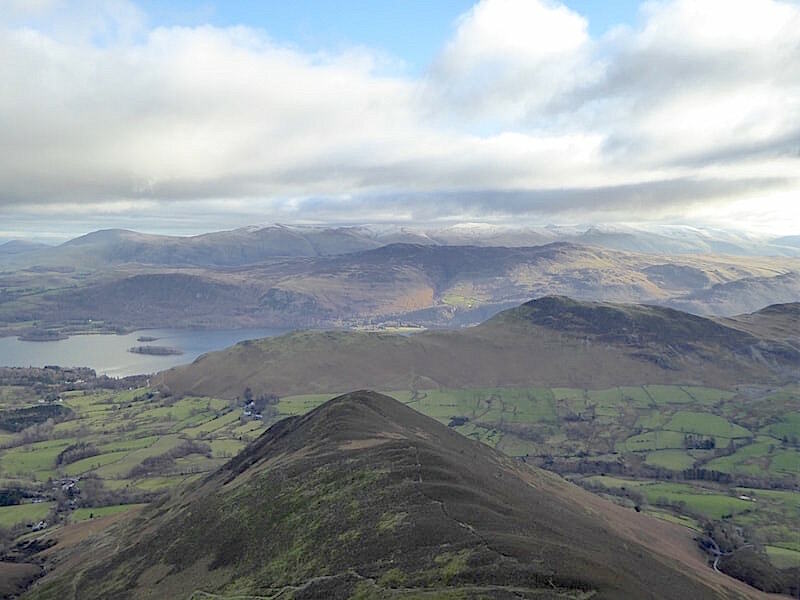 Catbells is stretching across the middle foreground and looking for all the world as if it has been cut and pasted onto the shot. Maybe its just the way I’m interpreting it but it definitely looks a bit weird to my eyes. 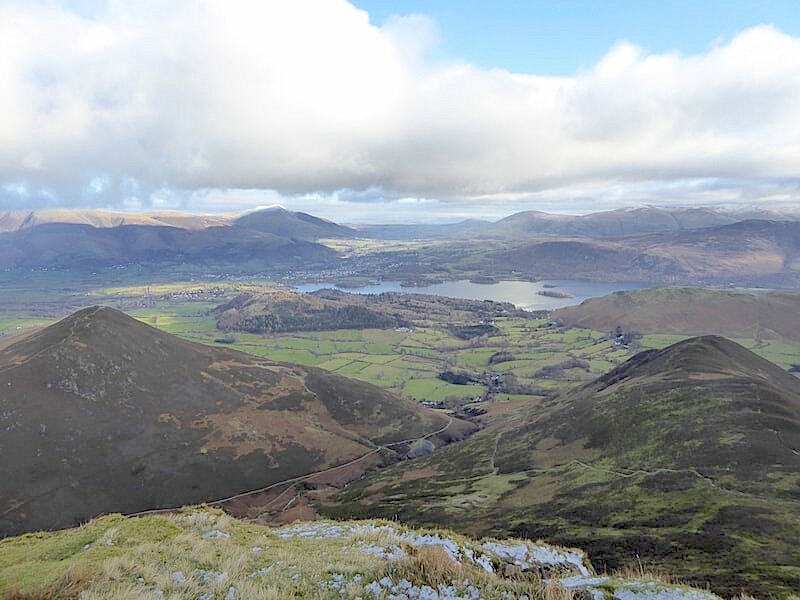 Over to the left of the summit, beyond Stile End and Barrow, is a glimpse of Bass Lake with the Ullock Pike to Carl Side ridge just to the right of it. 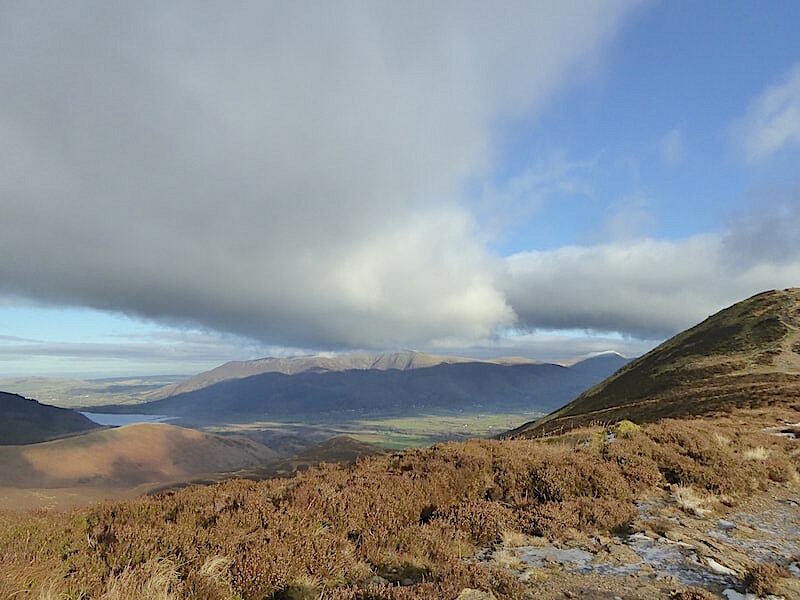 The top of Skiddaw is hidden by cloud at the moment. 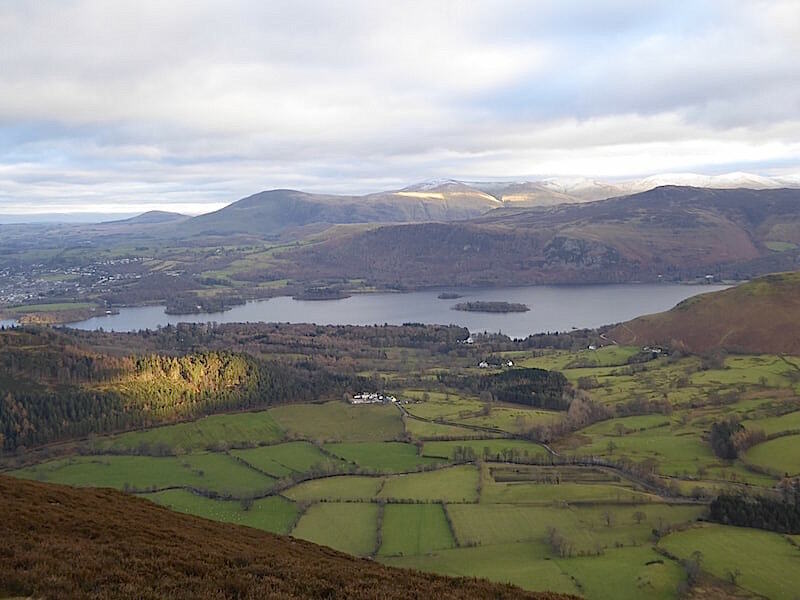 Looking across Derwentwater straight along the Vale of Keswick and the snowy top of Blencathra just catching a hint of sun. 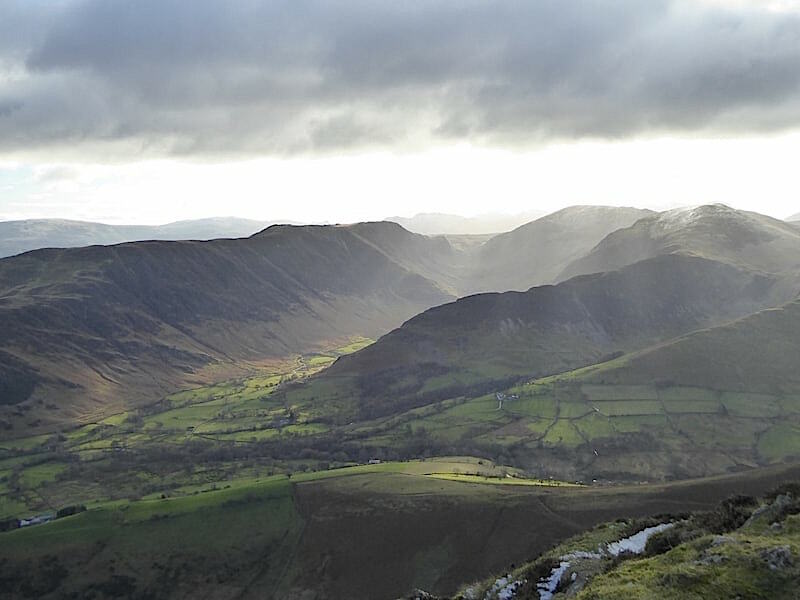 To the south east of the summit where shafts of sunlight are piercing the cloud and lighting up the fields of the lovely Newlands Valley, while the surrounding fells remain sunless adding atmosphere and drama. 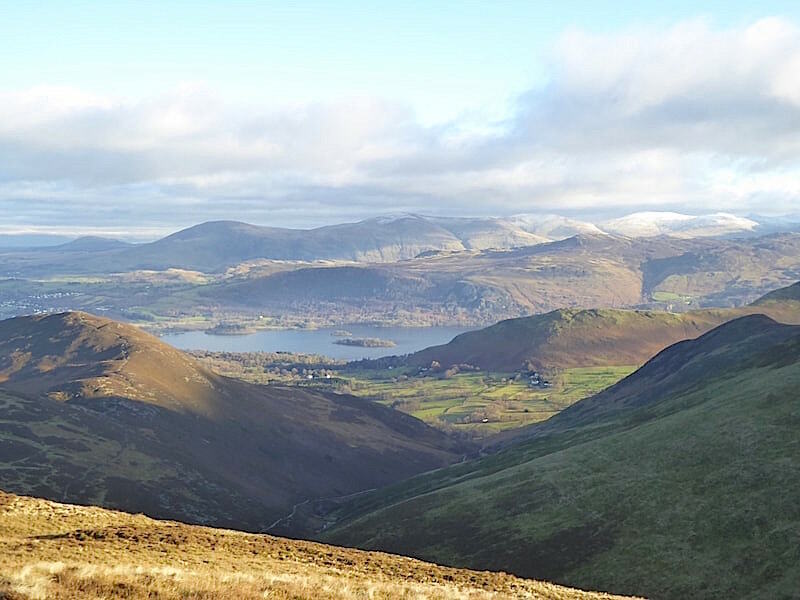 To the south west there’s this wonderful view of pretty much the whole of the Coledale Round, from here, on Causey Pike summit, all the way around to Grisedale Pike. Its a lovely walk, but a longish one, and needs a few hours to complete. I suppose if you were a quick walker and charged around it nonstop it could be completed in about five hours, or thereabouts. We much prefer walking it when the daylight hours are longer, and a bit warmer, because its a walk to be savoured and enjoyed, like a plate of delicious food, rather than something to be over and done with as quickly as possible. 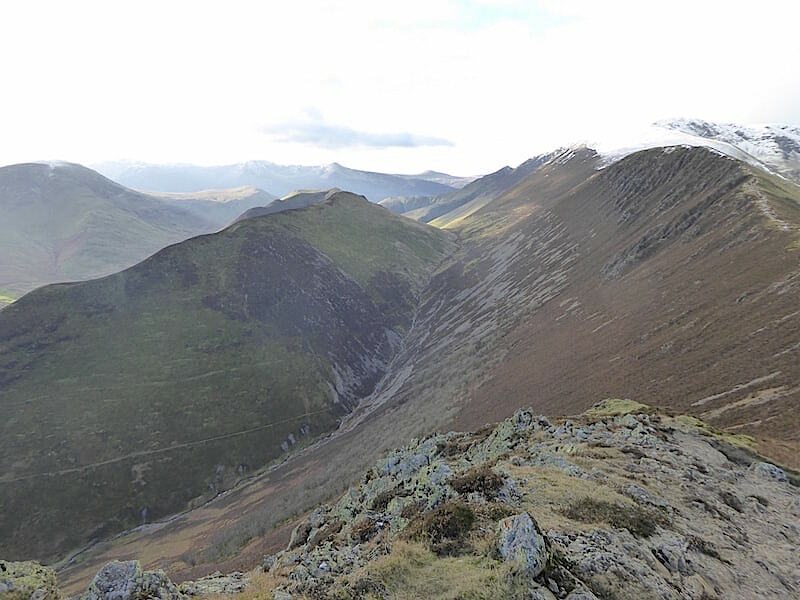 Below the summit, to the south east, is the vertiginous drop down to Rigg Beck between Ard Crags and Scar Crags. I’ve now got very numb fingers so its gloves back on and time to get going again. As we start to descend back to the col the cloud above us drifts away and we enjoy a decent spell of sunshine. 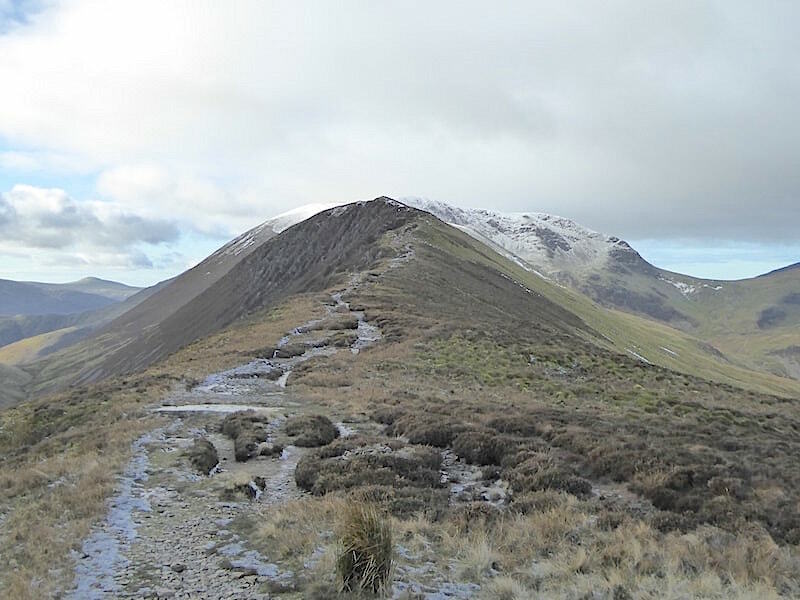 Scar Crags are directly ahead with the snowy tops of Sail and Crag Hill behind it, while over to the left we can see Red Pike and the long sweep from it over to Starling Dodd. 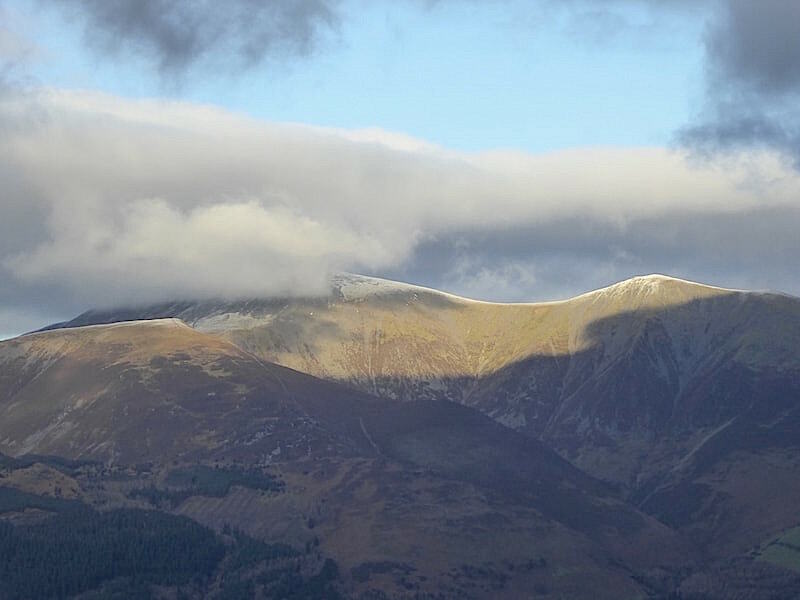 A long band of cloud above us stretching to the Skiddaw fells. These long bands of cloud were a constant feature today and added plenty of drama to the surrounding views. They weren’t quite so welcome when they hung around over us for any length of time since it was extremely chilly below them. 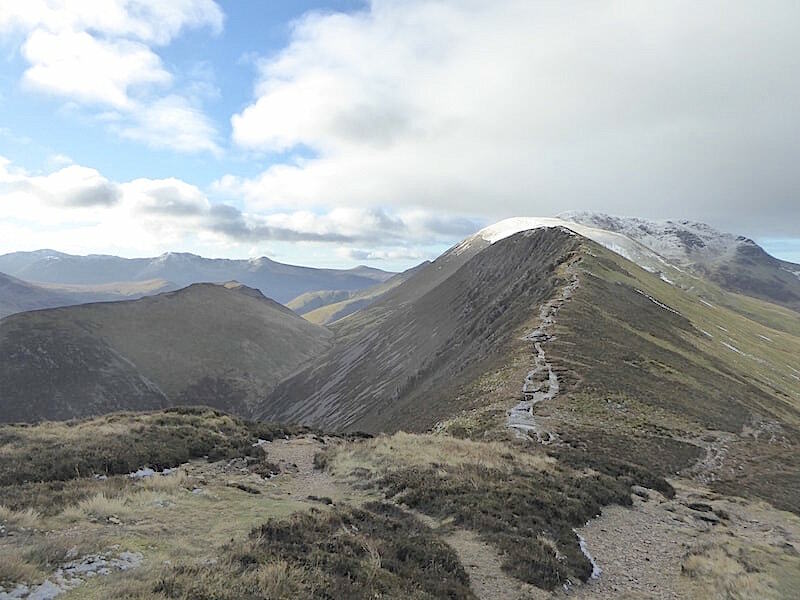 A look back at Causey Pike as we make our way along the ridge with the right hand side of our faces being chilled by the wind while the left hand ones were being toasted in the sun. Another look back as we progress along the ridge. 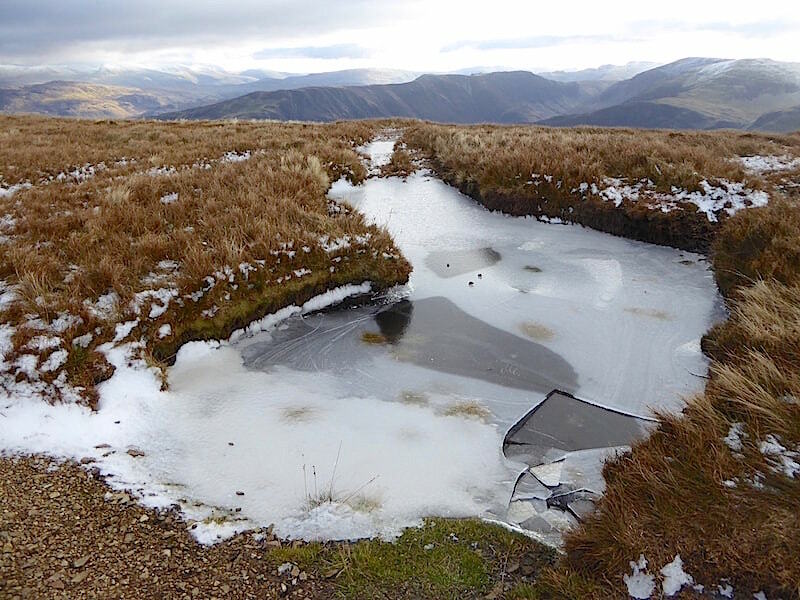 Lots of frozen pools around, as can be seen, but for the most part the path was firm and dry so it was an easy and enjoyable walk across. 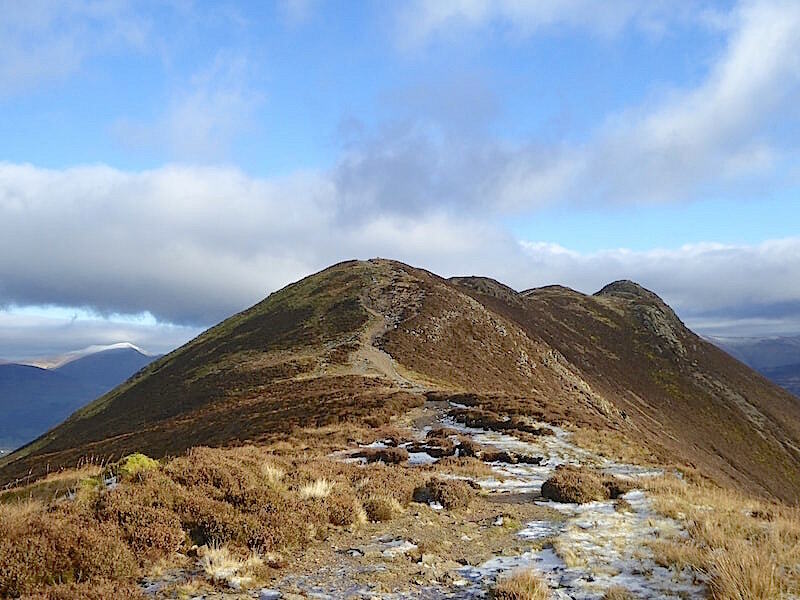 By the time we reached the cairn, where I’m doing a passable imitation of the Michelin Man, the cloud was back so the shot is somewhat on the dull side, although there is a hint of sun on Sail …..
….. while, perversely, Causey Pike is now bathed in sunshine. 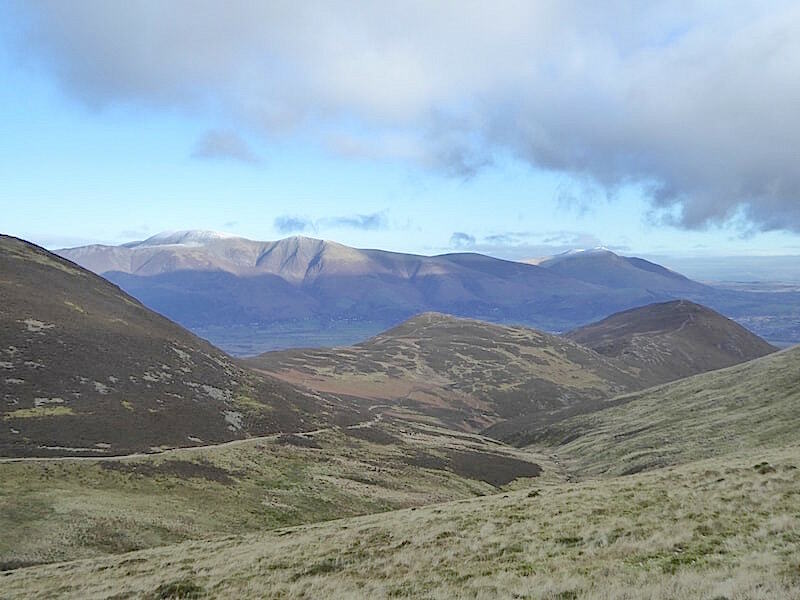 Over to the west the other fells above Coledale aren’t faring any better either. 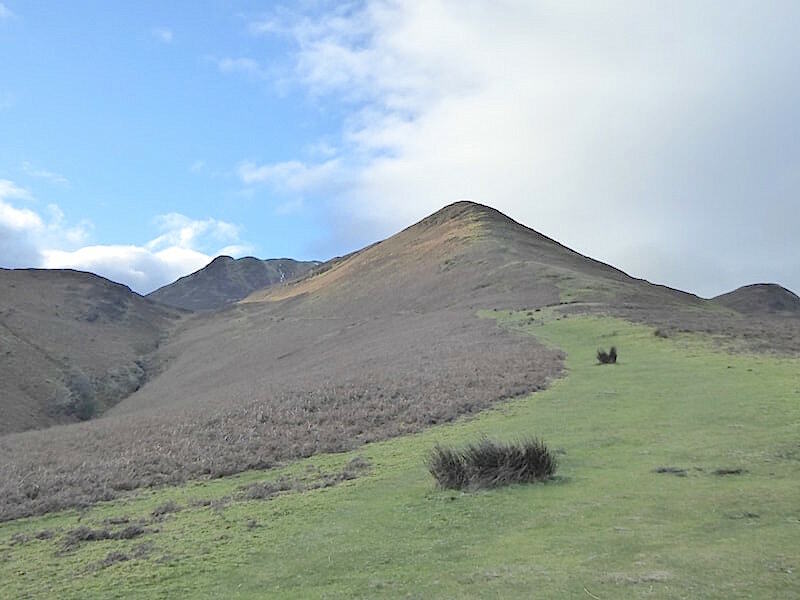 On the extreme left is Whiteside, then Sand Hill next to which is Hopegill Head. 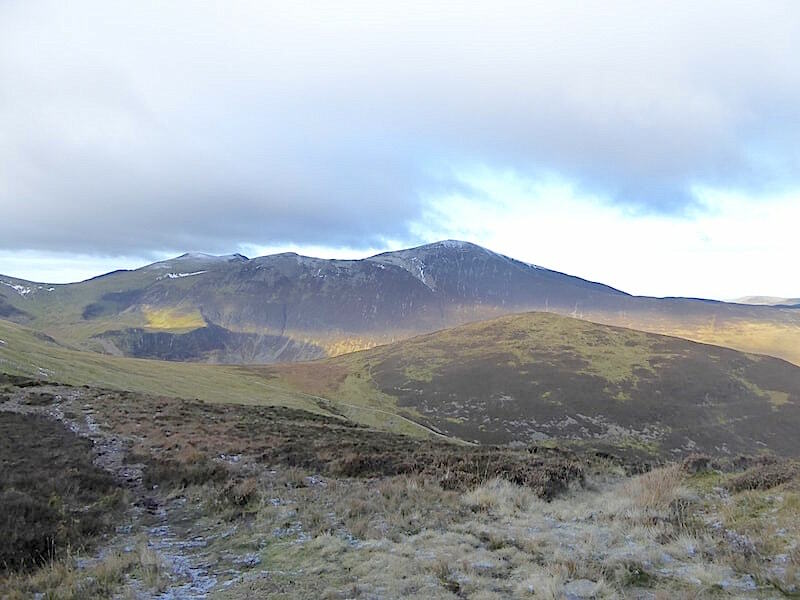 In the centre of the skyline are Hobcarton Crags and over on the right is Grisedale Pike. No walkers to be seen on any of them. 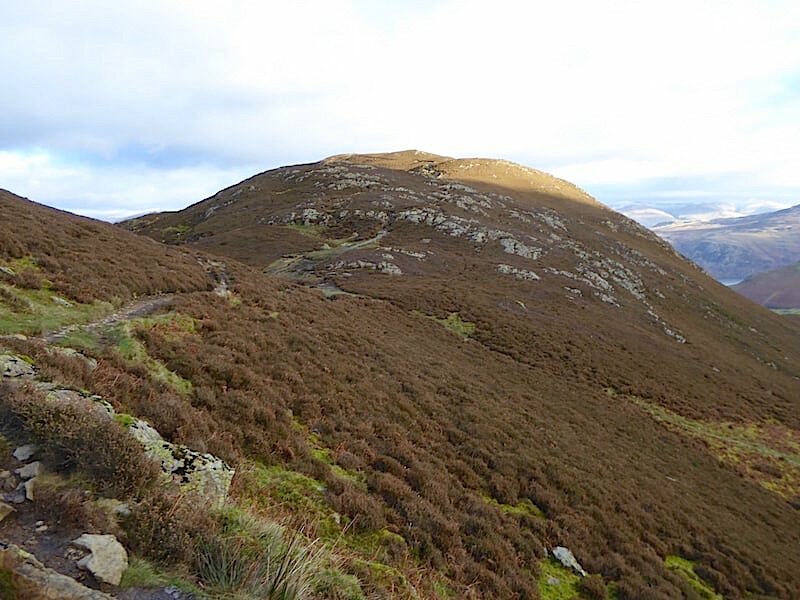 We carry on from the summit of Scar Crags over what can sometimes be quite a soggy route, although a number of stone crossings have been provided across some of the deeper marshy hollows. Even so there are still some large pools of water across here but they were mostly frozen over today. Another frozen pool further along, above which are more of those long bands of cloud I mentioned earlier. 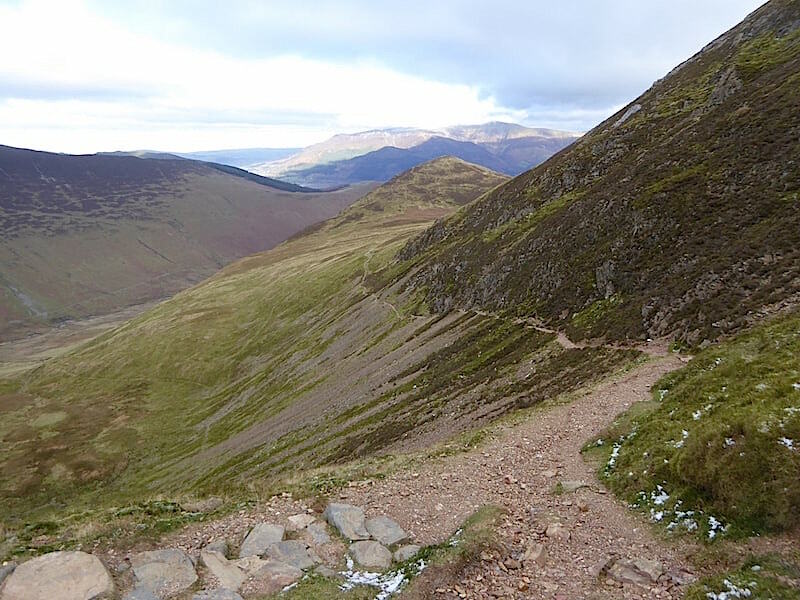 Here we go down to the pass between Sail and Scar Crags where we will take the path to the right. Rising up Sail is the much maligned path, created by the Fix the Fells organisation about six or seven years ago now. It seems to be taking a long time to ‘weather in’ as it was said it would at the time. There is a solo walker coming down it but he’s hard to spot since he was wearing all black clothing. Our right hand turn at the pass leads us down towards Outerside in the centre of the shot. The walker coming down the Sail path turned down here too, again he’s difficult to see because now he’s below a dip in the path where he’s stopped for a rummage in his pack. We haven’t used this path since 2011 and noticed there’s been a good deal more erosion, mostly by running water judging by the deep grooves in it, since then. Back on the level path and approaching Outerside where the solo walker ahead of us is now visible, although you might need to zoom in to spot him. He’s the little black speck in the brown grasses of High Moss and is just about to reach the rising grassy path just below the top of the shadow. We follow the same route as the solo walker and turn off to cross High Moss here at the cairn. He’s still visible walking up just below the left skyline. 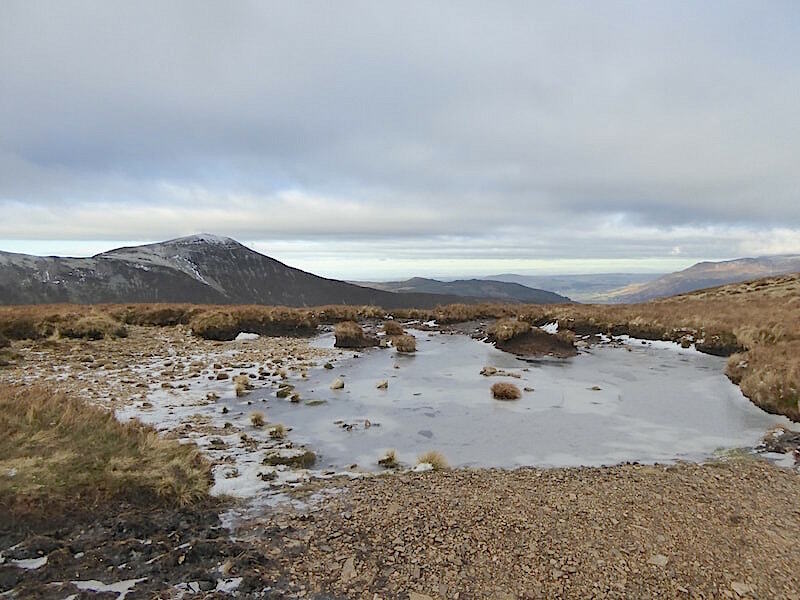 It wasn’t entirely frozen over on High Moss so it was a bit of a splashy crossing in places. Once in the sunshine and having found ourselves a suitable spot out of the wind we stopped for something to eat and just enjoy the sun, the view, and especially the hot soup and sandwiches. 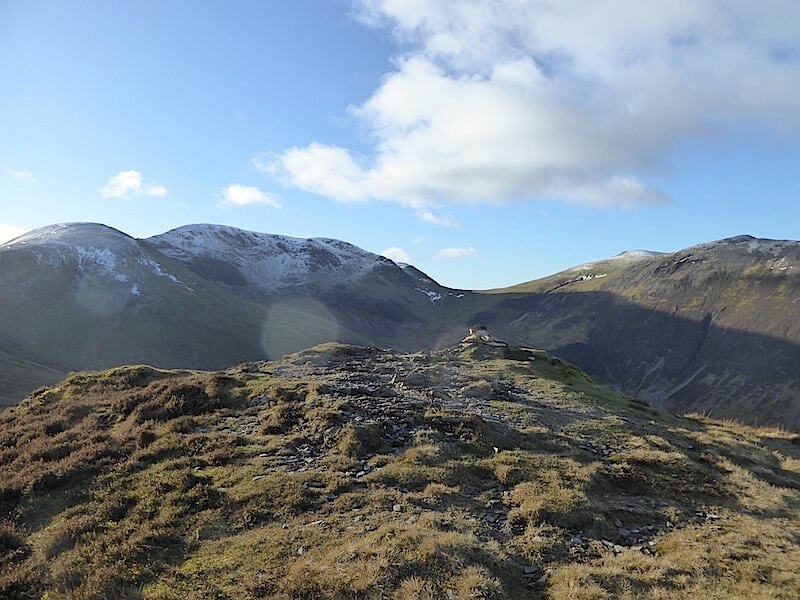 Coledale Hause in the centre with Crag Hill to the left and Sand Hill and Hobcarton Crags to the right, together with a couple of unavoidable sun spots bouncing off the lens. After our break we carried on up to the top of Outerside where we lingered a while just to soak up the sun and the views. No snow on Clough Head over on the left, a dusting on the Dodds to its right, what looks to be quite a good covering on Raise over to the right, and a lovely soft light being cast over the entire view. From Outerside summit a view across Stile End, Barrow, along the Vale of Keswick all the way across to the northern Pennines on the distant skyline, where you can just make out their covering of snow. There is still no-one else to be seen, even our solo walker has disappeared for the moment. More sun spots on the lens as I look back to the tiny cairn atop the highest rocks. Before we start the descent of Outerside we hold a summit meeting to decide which of the many paths down there we’ll follow. We opted not to cross over Low Moss and Stile End deciding instead to branch off to the right onto the thinnish diagonal path which starts at the crossing of the paths in the sunshine towards the bottom left of the shot. That will take us over reasonably firm, dry paths straight to Barrow Door. 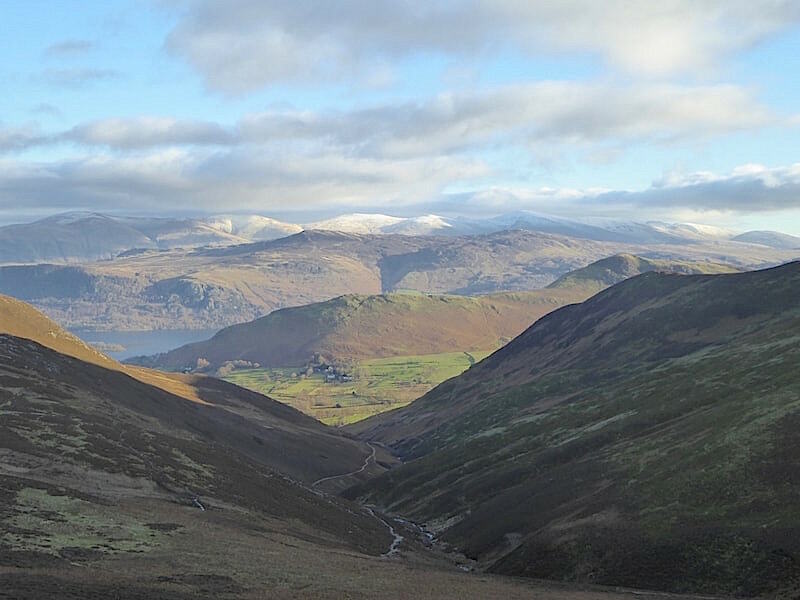 A look eastwards as we descend Outerside and the early afternoon sunlight is now illuminating a good part of the snowy Helvellyn range, although Helvellyn itself remains in the cloud shadow for the time being. Outerside’s descent path was dry and ice free so apart from taking the usual care over the rockier sections we reached our chosen path and headed over to Barrow Door without a great deal of difficulty. Barrow, our last fell of the day, is just ahead of us and as we cross Barrow Door and begin climbing we meet two walkers coming down towards us. They asked us if it was really wet across Low Moss but as we hadn’t crossed it we weren’t able to give information regarding its condition other than it is usually on the soggy side of the wet/dry continuum. A lady and her dog came along as we were standing there and who more or less said the same thing. She then bounded up the path in pursuit of her dog, we followed her at a less than bounding pace, and the pair of walkers carried on down to Barrow Door so I can’t say what decision they come to in respect of Low Moss. 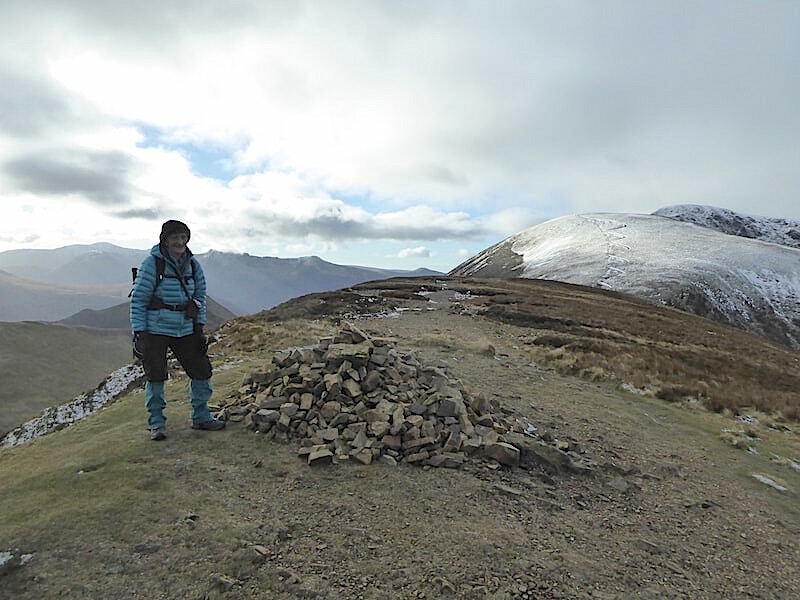 The view over to Skiddaw summit as we climb the undulating but easy path up to Barrow summit. I’d been watching the bank of cloud around the top for some time and hoping it would move but it refused to do so until we were almost back at the car. 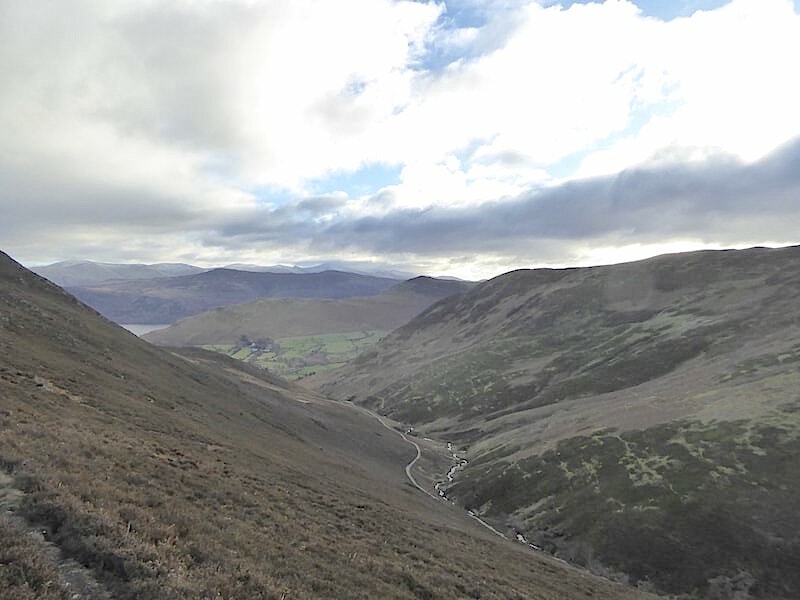 We’re almost at the top of Barrow now so I take a look back at most of our route today. We arrived at Barrow Door on the path coming in from the lower right corner, rounded Stile End and kept to a higher path above Stoneycroft Gill. 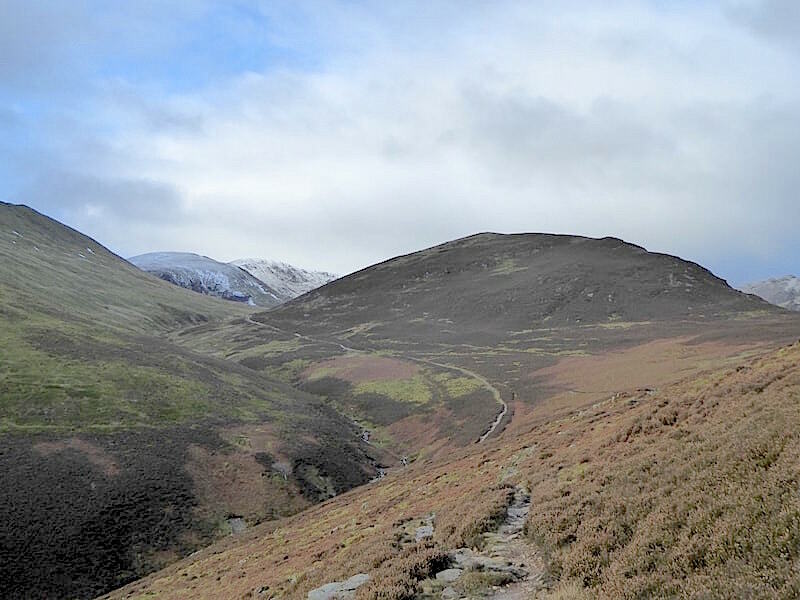 Having joined the Stoneycroft path below Outerside we left it just beyond the sheepfold and traversed across the green slopes of Causey Pike, over to the left. From the summit we walked the ridge across Scar Crags at the top left and then down the pass between it and Sail, across to Outerside and finally over to this point. 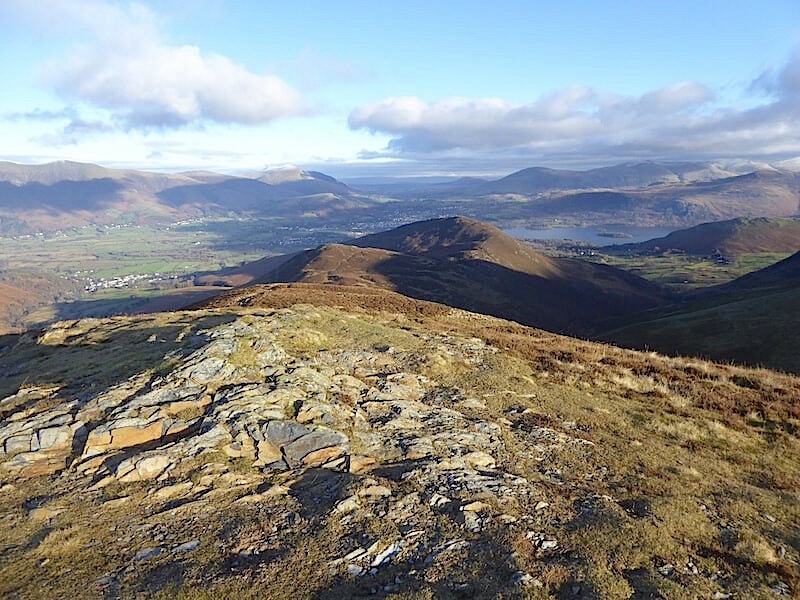 There isn’t a cairn or trig point to mark the summit of Barrow so I can’t show one, but the views are very nice from it, especially when beams of sunlight manage to find gaps in the cloud and sprinkle a little brightness over Swinside and some parts of Keswick. Swinside still holding on to its little ray of sunshine and a couple of bright spots over the Dodds. 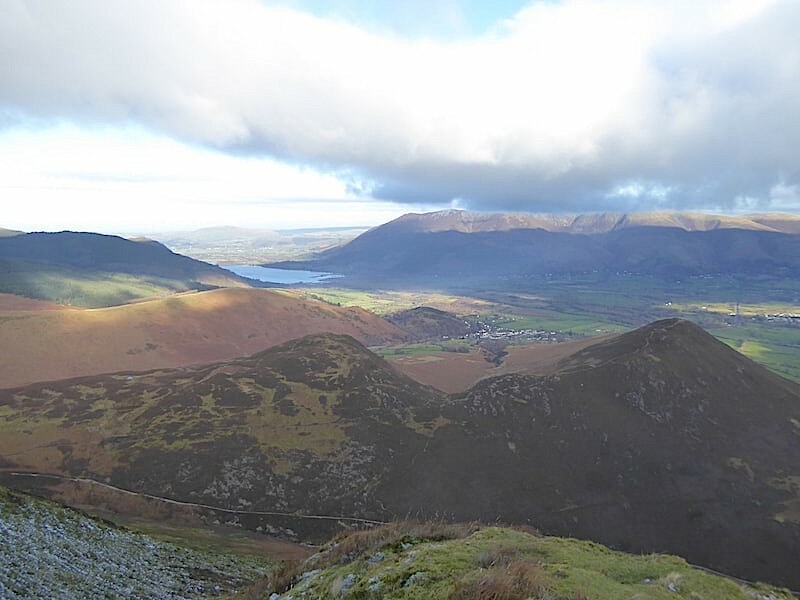 The Newlands Valley from Barrow summit. Its a lovely valley but its not looking quite at its best now thanks to all the thick cloud. 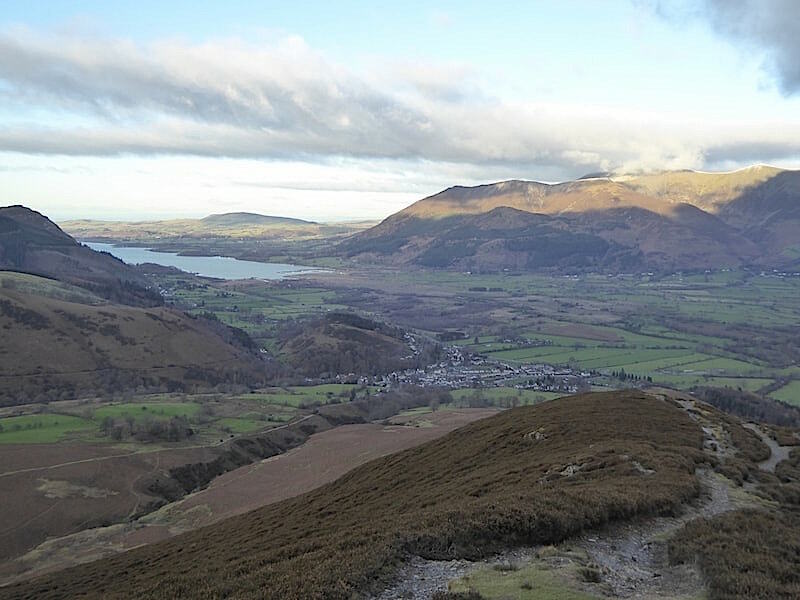 Descending from Barrow back down to Braithwaite. 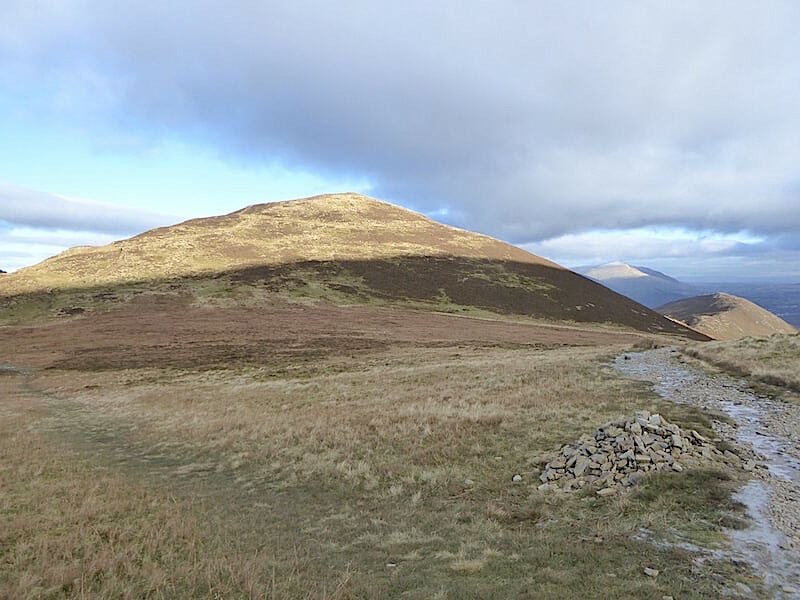 Skiddaw summit still has its swirl of cloud, something which Binsey, on its own in the distance to the left, rarely experiences. Once again we caught sight of our solo walker making his way down ahead of us although by now he had swung over to the left and out of shot. 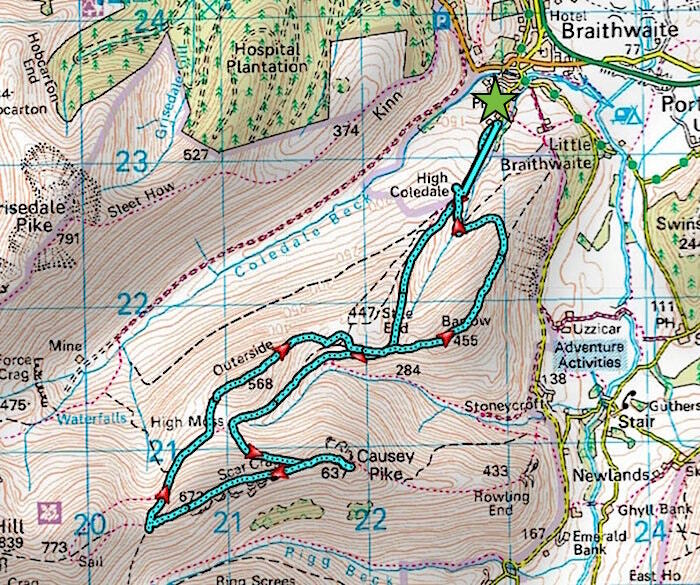 We take the same route, drop down to cross Barrow Beck and then join the path above it which we started out on this morning. When we reached the derelict building at High Coledale we took the little detour to the left of the main path to have a closer look at it. 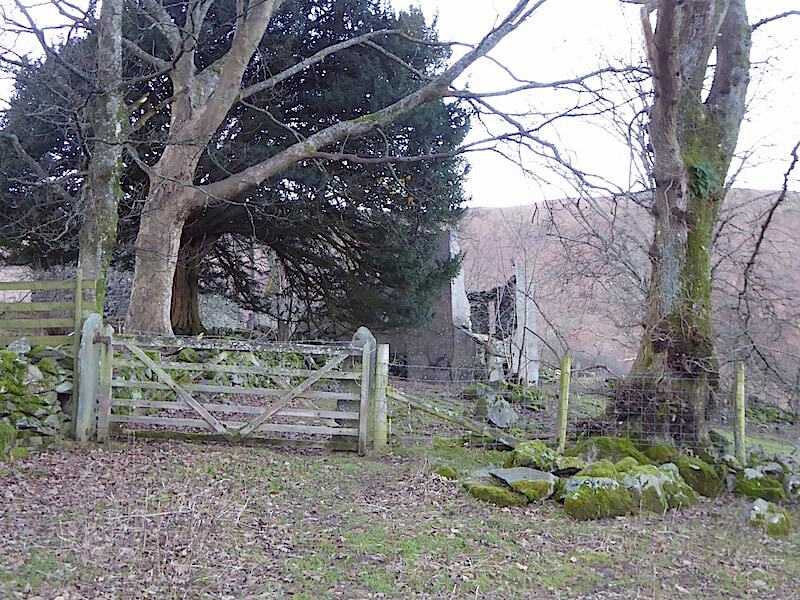 The gate was only fastened with a loop of baler twine and no notices forbidding entry so in we went. A very old stone built farmhouse, with a later brick built extension, with a large barn to its right …..
….. and a rendered north facing wall, while to the left of the very low doorway were the remains of a small lean-to, possibly a wood shed at one time. Roofs timbers still lying where they fell and pieces of a broken Belfast sink lay scattered around. 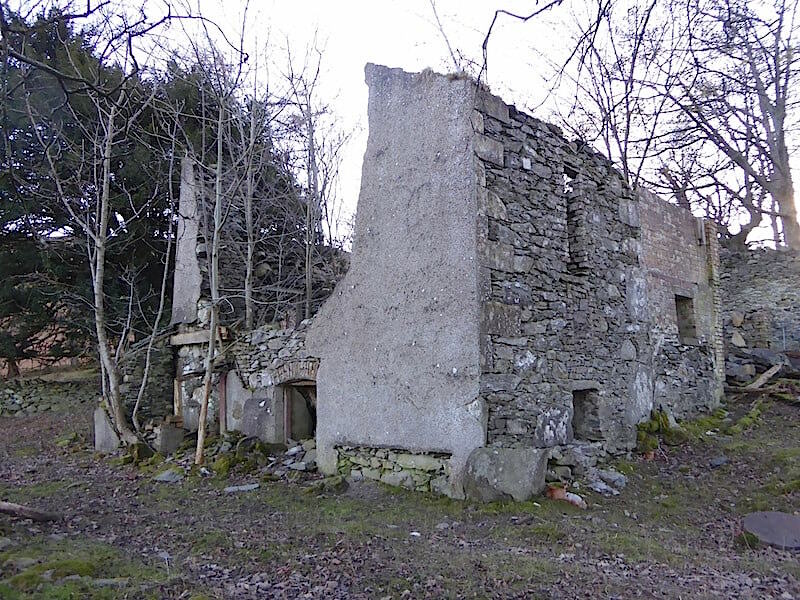 Its hard to imagine now that it was once a working farm and a family home. Back on the track from the farm now and walking back to the car. 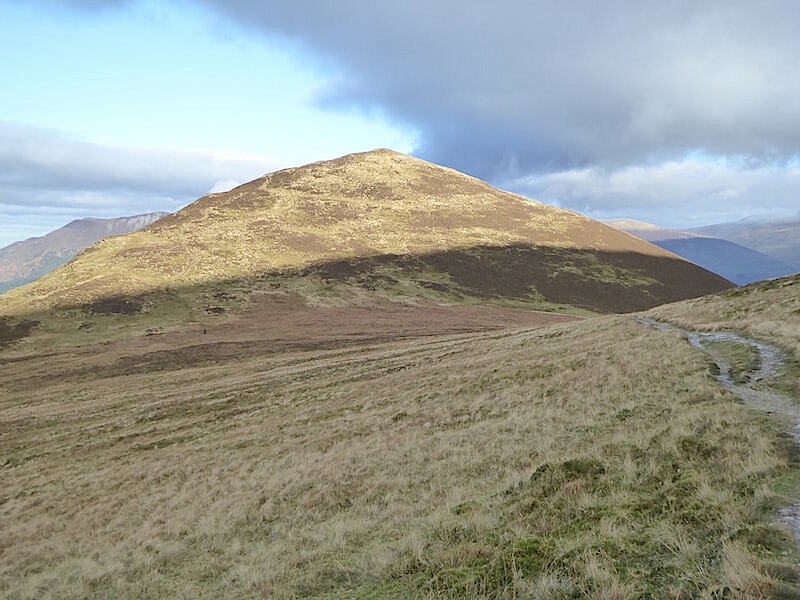 At last the cloud has moved away from the summit of Skiddaw and the sun is back out again, although it has just dipped below Causey Pike so we are back in the shade for the remainder of the walk back down. Its almost 3 p.m. and, despite knowing that the sun will be setting in fifty minutes, it always feels not quite right to be coming to the end of a walk in what is still only the middle of the afternoon. Still, that’s how things are for the time being and it won’t be too long a wait until we turn the corner on 20/21 December and the daylight hours slowly begin to get longer. 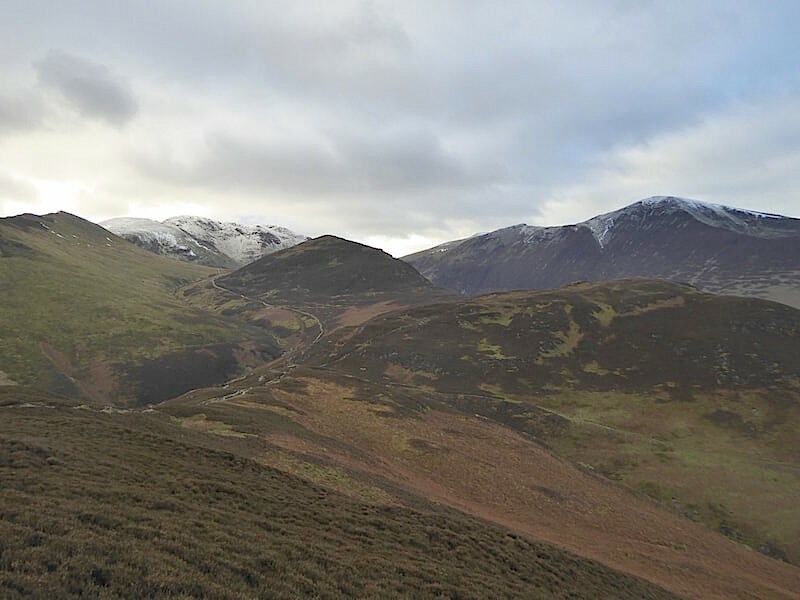 No matter what the season though a walk over the fells around Coledale is always enjoyable and today was no exception.